If you are looking for information on the Children's Technology Workshop franchise business opportunity, CT Workshop franchises or CTWorkshop franchising, then you have come to the right place. Technology learning, through camp, after-school and in-school enrichment programs represents one of the fastest growing segments of today's multi-billion dollar supplemental education market and CTWorkshop is leading the way. Children's Technology Workshop™ is one of the largest operators of camps and after-school programs in Canada, a country with world-leading educational standards. Our leading-edge curriculum covers current and relevant topics that pique the interest of today's youth. Topics include engineering, robotics, animation and video game design and are available to children through camp, after-school and in-school venues as well as at third party facilities such as community centres, science centres and other facilities. CTWorkshop's goal is to pique the interest of children in the areas of science and technology and help them apply technology in ways that are meaningful to them. We are serious about having fun and take pride in our commitment to developing the finest technology- and science-based programs available to children. Demand for our programs has increased dramatically, and we are now licensing our programs to qualified partners. Our partners range from individuals, corporations and non-profit organizations such as museums and any other organization looking to add to its curriculum base. With our flexible and portable icamp™ curriculum franchisees can deliver programs from virtually anywhere, for various lengths of time. 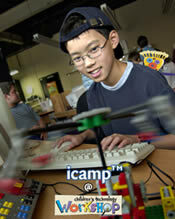 Our icamp™ programs run for a week at a time during the summer, spring break and the winter break. However, the curriculum is so flexible that it can also operate as a single or multi-day event. Special events and after-school workshops can operate part-time anywhere from one to four hours per workshop or event. Our after-school enrichment programs cover topics such as early literacy skills, engineering, video game design and science. Our birthday party curriculum provides children with opportunities to learn engineering and science concepts during shorter workshops and provides the franchisee with great marketing opportunities. We encourage franchisees to expand and develop their businesses by granting exclusive operating areas that are generous in size, encompassing areas of up to 600,000 people. We encourage franchisees to deliver camp and workshop programs from multiple locations, allowing them to build a financially rewarding summer camp business, or a year-round operation anchored at their own learning center within the community. CTW's unique and proprietary curriculum, software and adventure programs and proven operations and training programs are behind our great success. We've spent nearly eight years building a reputation for delivering the highest quality educational experience, and our customers have come to expect nothing less. The CTWorkshop management team has close to 50 years of successful franchising experience. Along with our highly skilled professional staff-which includes engineers, educators, programmers and technology enthusiasts-we have created a world-class infrastructure and leading-edge systems that will help ensure the success of our business and you, our partner. Enjoy the Success of a Rewarding Business: We provide the resources and support; you provide the commitment to deliver a quality technology-based education program. The reward is two-fold: instilling valuable life-skills to children through imaginative, compelling programs, while you enjoy a solid return on your investment. Together, we can change the way children learn and use technology, from the ground up.